One day I really missed having banana bread, so I looked into my kitchen to see if I had ingredients to quickly bake a fresh loaf of banana bread for my afternoon tea. Luckily I had one egg and one extremely ripe banana left, so I decided to experiment and see if it was possible to make a gluten-free and dairy-free banana bread with only one egg and one banana. 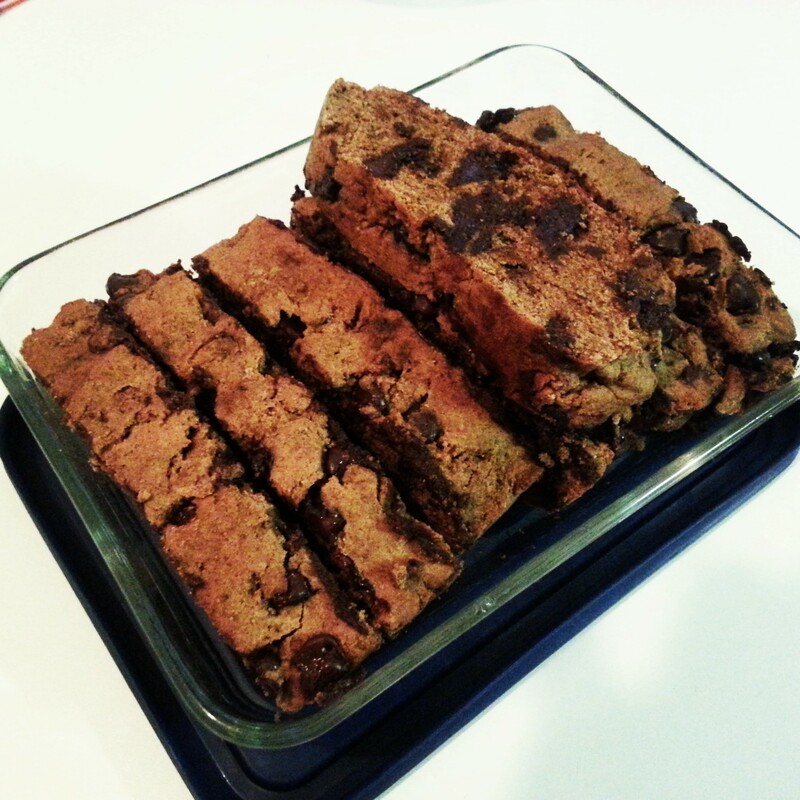 I added chocolate chips because I’ve always loved the combination of banana and chocolate. To my delight, the result was one delicious, naturally sweet and dense loaf, perfect for my afternoon snack! Happy Baking my dear friends and readers! Line small-medium loaf tin with baking/parchment paper. Mix wet ingredients into a blender/food processor. Combine dry ingredients (without chocolate chips) in a large bowl. Add chocolate chips slowly into the mixture. Bake for 25 minutes or until firm. When I went shopping for baking ingredients, I got inspired by the mint chocolate chips and Christmas-coloured chocolate chips (red, green and white) at the store. Therefore, I couldn’t resist buying both to create these yummylicious and fun Christmas cookies! In another bowl, mix olive oil and sugar until well combined. 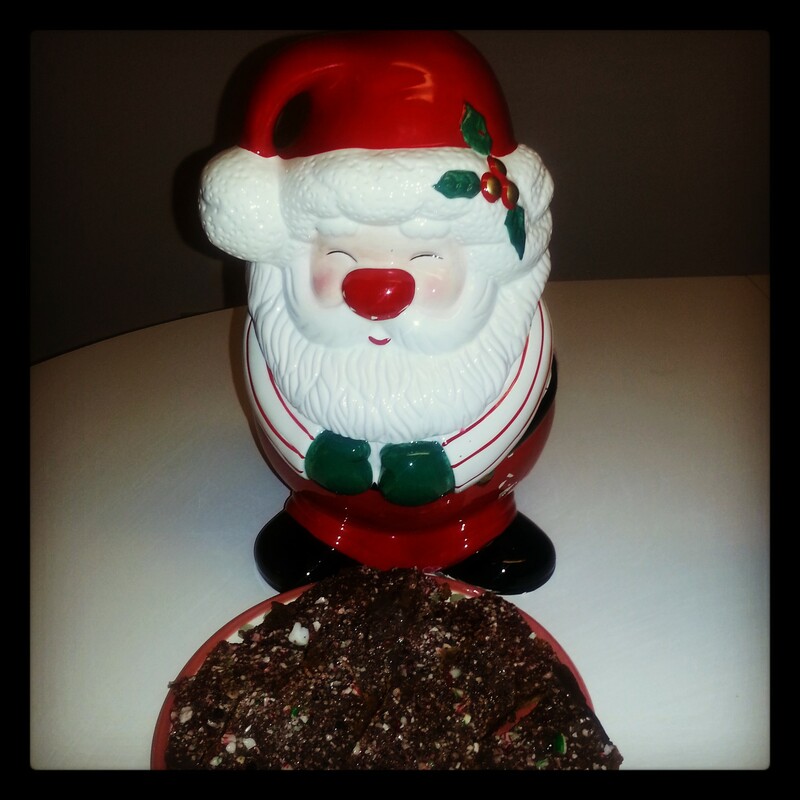 Slowly add chocolate chips into batter, making sure both mint and Christmas chocolate chips are evenly distributed. With damp hands, roll 1 tablespoon of the batter into a ball, place it on the baking sheet and flatten it slightly. Continue until batter is gone, spacing the flattened balls 2 inches apart. Bake the cookies for 13 minutes. –Extra Virgin Olive Oil: used in replacement of butter/margarine because it’s not only healthier (cuts back on cholesterol and saturated fat content) and dairy-free, it also makes the baked goods lighter and moister! 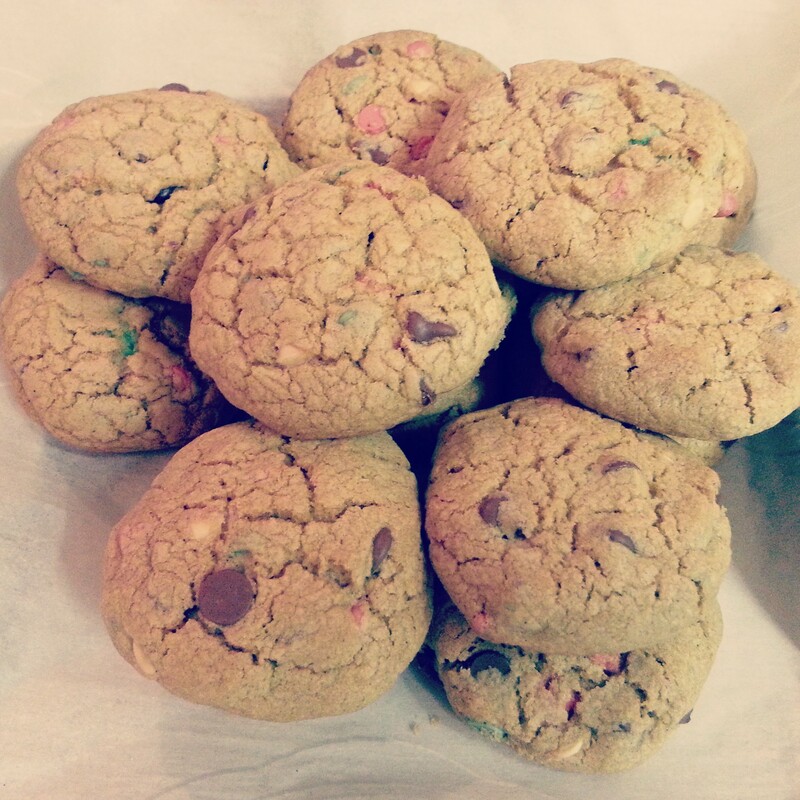 -If you don’t have mint chocolate chips, you can replace it with crushed candy canes to give it a minty taste. I’m thrilled that my holidays has officially begun, despite the ice storm raging outside, and I can finally relax and enjoy this time with family and friends, and have some personal me time as well. 🙂 It’s been a crazy past two weeks trying to balance everything from Christmas shopping, personal appointments and commitments to work demands etc. During these past two intense weeks I also began my holiday baking. In fact, I have been baking daily for about a week now. I have decided that this year I just want to bake for family and friends as gifts. While it is time- consuming, it is also very pleasurable and rewarding! I’m super excited to share with you two easy and quick yummy recipes that was a big hit with my family and friends, and these baked goods also look very festive as part of a dessert platter for any party this holiday season! 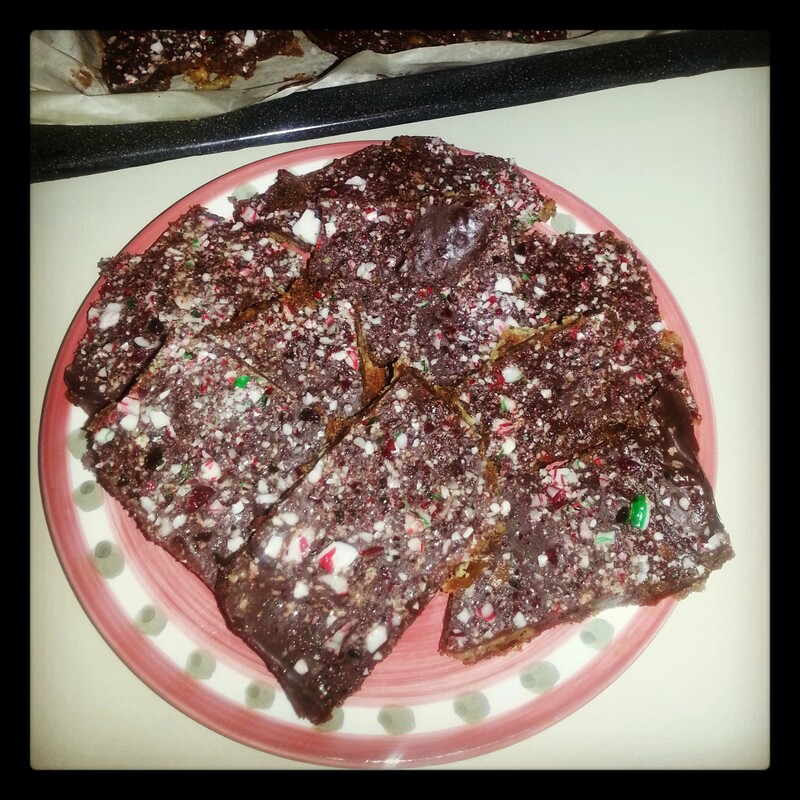 *I got this Breton Brittle recipe from a classmate in my cooking class; I altered it slightly to make it gluten-free, dairy-free and “Christmas-y” too! Line the bottom and sides of a cookie sheet with aluminum foil or parchment paper. Arrange a layer of crackers on the foil/parchment paper. Fill in spaces with broken crackers. In a medium saucepan, combine the sugar and margarine. Cook and stir over medium-high heat until the mixture comes to a boil and appears “frothy”. Keep stirring and don’t let the mixture burn! Pour the mixture evenly over the crackers. Bake at 400°F for 6 minutes. Remove from oven and sprinkle with chocolate chips. When the chips become soft, spread evenly over the cracker mixtures. -The longer you let the sugar/butter mixture “froth”, the harder the caramel will be. If you like a softer caramel, pour it on the crackers right after it comes to a boil. -I used 1/2 cup of organic coconut palm sugar instead of an entire cup of brown sugar because I like the fact that the organic coconut palm sugar has a low glycemic index (this holiday treat is so sweet already so trying to look for a way to “lower” a bit of the sugar level and make it slightly “healthier”). Plus, it has a richer caramel and/or butterscotch flavour than brown sugar. I wish an entire cup of organic coconut palm sugar could have been used to make the caramel. 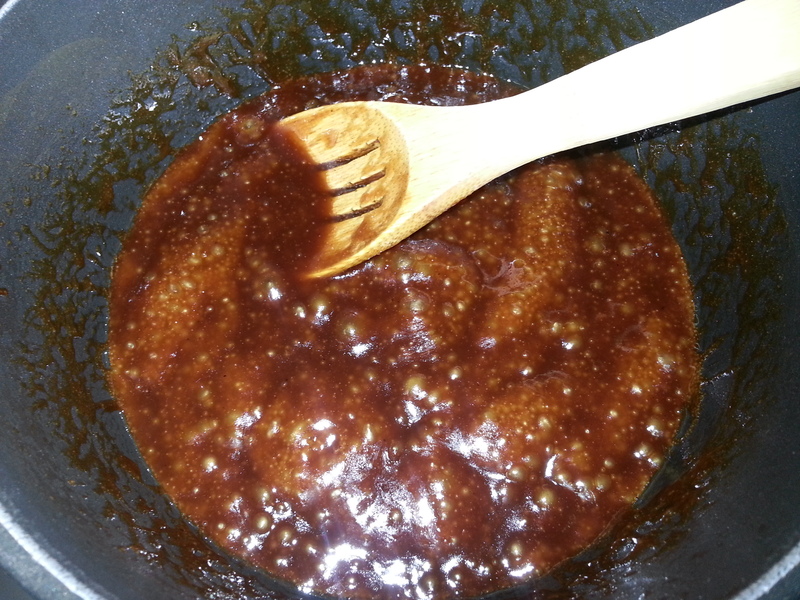 Unfortunately while experimenting with only a cup of coconut palm sugar, I discovered it wasn’t combining well with the margarine, so a little bit of brown sugar had to be added in order for the caramel to form. Sweetness- You can control the degree of sweetness by reducing the amount of maple syrup to your preference. Mango- Eating this nutritionally rich fruit is good for you in so many ways! To name a few health benefits from eating it: it is anti-cancer, alkalizing and has a low glycemic index (regulates blood sugar level). Also, it aids in digestion and clears the skin! 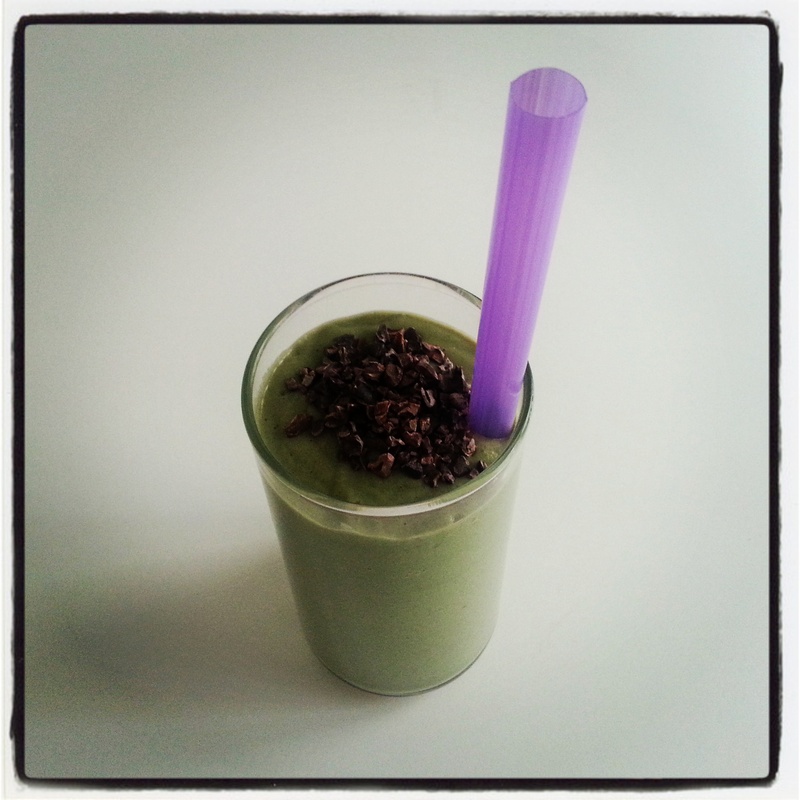 Put avocado, mango, flaxseeds, cacao powder, maple syrup and vanilla extract in a blender. Sprinkle a handful of raw cacao nibs (along with remaining mango if you like) at the top. So I was on a pumpkin baking frenzy, trying to finish up the pumpkin puree I had stored. Unfortunately I ran out of gluten-free flour, but had some whole wheat flour left from before I became gluten-free. Therefore, I decided to use it to make some pumpkin bread for my classmates from my cooking class and even had extra to share with a friend. 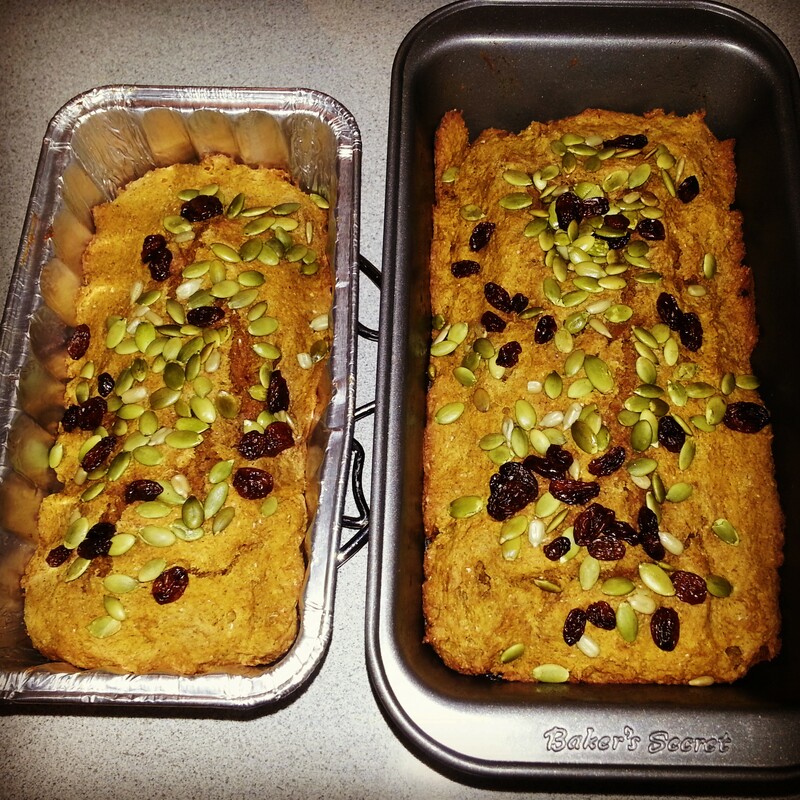 According to everyone, the pumpkin bread is very healthy, fresh and tastes “organic”. -To make it sugar-free, you can choose not to add in the honey. If you have sunflower seeds, pumpkin seeds and raisins, mix them together and you can sprinkle a handful of them on top of the loaf. Make a hole in the centre and put in eggs, coconut oil, honey and vanilla; mix well. Fold in the pumpkin puree and mix. Pour batter into a well-greased large loaf pan. Sprinkle sunflower seeds, pumpkin seeds and raisins on top (if you have). Bake for about 30 minutes; check if it’s completely done by inserting a toothpick to see if it comes out clean. Let bread cool completely, or wait about 10-15 minutes to eat it freshly hot/warm. Life has been very crazy busy lately. For example, within one week (last week), I witnessed 3 beautiful weddings, new beginnings for 3 amazing couples, and experienced the passing of a loved one. Such is the circle of life, and the joys and sorrows that is all part of living. The only thing we can do is enjoy and appreciate every moment, including the ups and downs of life, and just go with the flow; and cherish memories. Fortunately my father still has an appetite and a sweet tooth, despite his disease. I know he secretly craves his Tim Hortons’ muffins but he is no longer allowed to eat “outside” or processed food, so homemade food is the way to go. 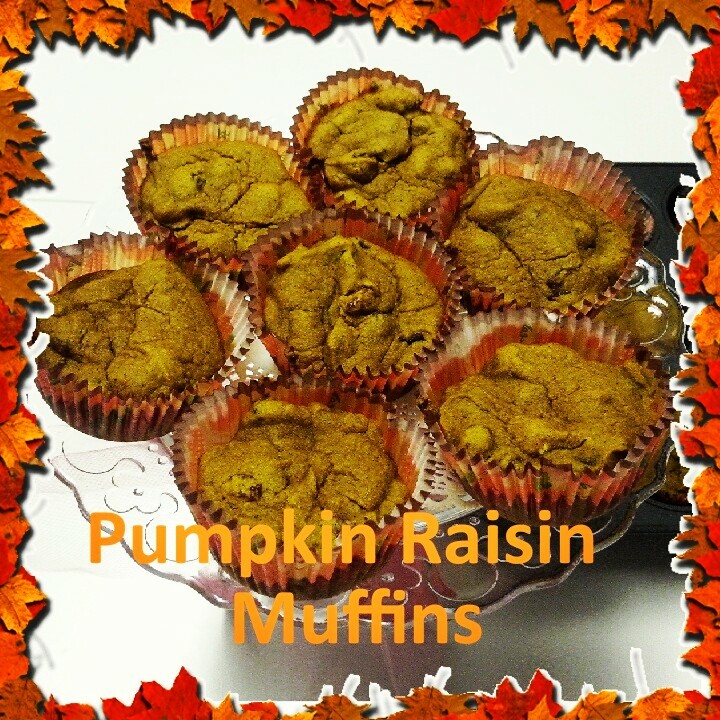 Using only natural ingredients such as pumpkins, bananas and raisins, I dedicate this Fall-inspired gluten-free and dairy-free muffin recipe to him. He really liked eating these muffins that I made especially for him! Slowly add raisins into batter.